OG Yoga is a San Diego nonprofit with a mission "to deliver trauma informed mindfulness based yoga through partnerships with non-profit organizations serving marginalized individuals to support healing, resilience, self-development and positive social change." Every $150 we raise pays for an entire class for a group of people in need. OG Yoga's partnerships include Boys & Girls Clubs, Kitchens For Good, The Braille Institute, Girls Rehabilitation Facility, Alternative Healing Network's Tubman-Chavez Center, Naval Brig and Department of Corrections. Now through December 15th, when you donate $111 or more to OG Yoga, you'll receive two free tickets to one of our classes at the Take a Holiday Breath Restorative Yoga Series at Hotel Del Coronado. Learn more about the event here. Learn more about OG Yoga in the video below. 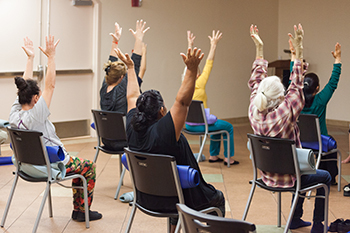 OG Yoga brings yoga to those most in need of the peace yoga inspires. Donating $25 for every Young Living Premium Starter Kit purchased at Take A Holiday Breath sessions at the Del Coronado. I l just love OG Yoga's mission! I will be donating $25 for every Young Living Premium Starter kit purchased through their Yoga on the Beach series. Searra Ruggeri YTT balance. Thank you!